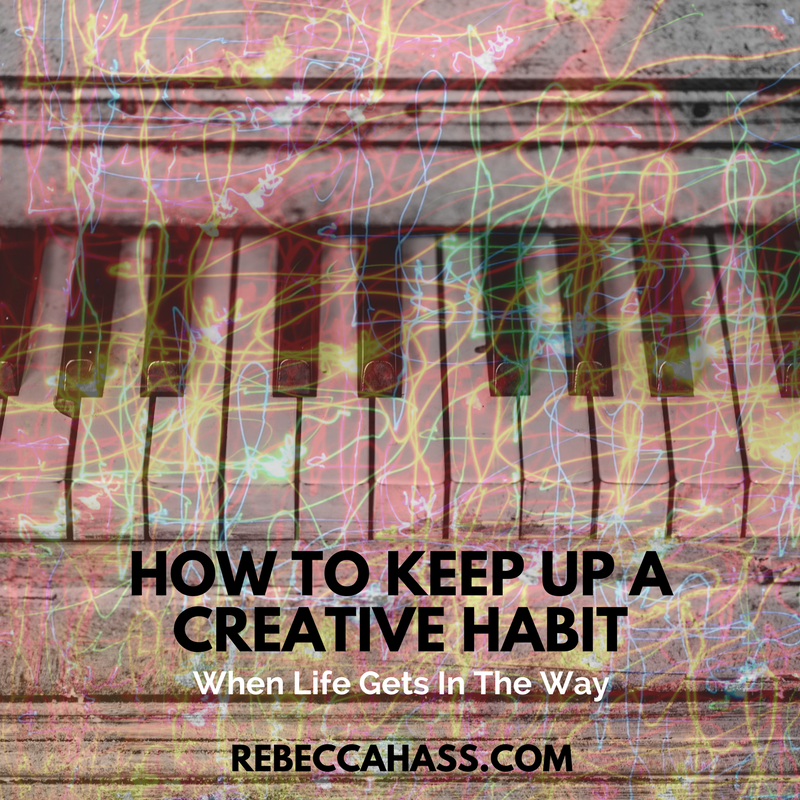 Keeping up creative habits (or any habits) is not easy, but it can be done! Mainly, I kept it to a manageable amount of writing (only required myself to write 8 measures a day), and chose a format to my challenge that included public accountability (more about that later). Some of us have this idyllic, Pinterest-fueled idea of creative habits (sitting down to write in a picturesque place with a hot beverage and a smile), but really, daily life has lots of obstacles, there's resistance, distractions, the list goes on. If you’re like me, on the positive side, your creative habit makes you feel more like yourself, connected to the universe, excited about life, curious, interested in things, etc. This is how I strive to feel (although I have no magical unicorns flying around)! Despite all of these good feelings that come from creating, there’s the negative side, too - feelings of self-doubt, uncertainty, all of the feelings! (seriously, read The War of Art). When it comes down to it, you have to know your why for your creative habit. For me, part of it is knowing that I want to amass a body of work that will make me proud when I get old. In the muck of the everyday, that’s not always easy to remember, but I don’t like to make Future Me mad at Past Me (that’s the worst). Make sure you don’t just plain forget to do it (especially early in the habit-forming process). Reminders of your why - visual reminders in your workspace, on your bathroom mirror, even paper that you’ll trip over on the way to door. There will always be obstacles, so a commitment to yourself and your habit is crucial. Figure out a trigger for your habit (for example, you could always do it first thing in the morning or after another activity). Make yourself feel successful, with realistic, or even ridiculously small goals (floss 1 tooth) - do it daily no matter the outcome. Expect resistance - it won’t feel easy or inspiring every day, and this is totally normal. Check in with yourself regularly to see how/if your habit is working, and tweak your commitment as needed - this is okay! Get more comfortable with uncertainty - the blank page can bring up so many other uncertainties that we feel, especially when creating is our work (am I any good at this?, etc.) So, you have to know yourself and know your excuses. Leo Babauta addresses this really well in a recent Zen Habits post. Public accountability (if that motivates you) - I’ve been reading Gretchen Rubin’s book The Four Tendencies, which sorts people into 4 types based on how they respond to inner and outer expectations. I’m an Obliger (tends to meet outer expectations, and resist inner expectations) with a lean towards Upholder (tends to meet both inner and outer expectations). This book is more fascinating to me than most other “personality type” books because it really addresses different ways that people are suited to forming habits (super useful to me as a teacher). DON’T GIVE UP! The process of forming habits is also a learning process. So, give yourself some grace. If you miss a day, this is not a failure - just start back up the next day. People who miss two days in a row of a habit are way more likely to give up entirely. If you’re a musician who wants to compose more, and is also motivated by external accountability, you can join the Creative Musician Club to form some community around your habit! I’m taking a small group of people this fall to test out some prompts, starting Monday, November 6. You’ll get 21 daily emails, each with a prompt to get you started writing a piece of music. These prompts aren't intended to make you finish each piece, but just to plant a seed, so, if you participate for a week, you'll already have 7 new ideas! You’ll also get an invite to join a Facebook group where we’ll share successes and struggles - a great place for encouragement and accountability. I'm going to be doing the prompts right alongside you, too, as part of my 100 More Days of Writing Music challenge - you can follow along on Instagram here. EDIT: This 21-day challenge is over, but I'm formulating a free course that includes daily prompts and access to the Facebook group - to be notified when it opens, sign up below! You're in! Thanks for joining - I'll be touch as soon as the course is ready! Are you a musician who wants to compose, but struggle with finding time and ideas? Sign up to be notified when my free 5-day course of bite-size creative composition prompts is ready (daily email + access to our friendly Facebook accountability group)! What are your struggles with keeping habits, creative or otherwise? Let me know in the comments!